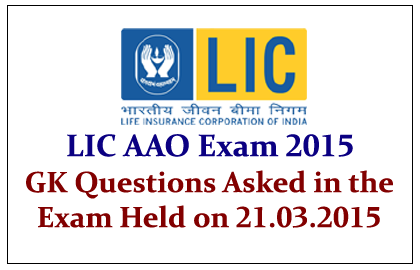 The Set of GK Questions asked in LIC AAO Exam which was held on 21st March 2015 was given below with answers, candidates those who are preparing for the upcoming exams can use this. Who has prepared the Economic Survey 2015-16? As per Budget 2015, which tax will be abolished? What is the Venue of T-20 World Cup 2016? Who is the last member to join the “Euro” Membership? Who is J P Nadda? Name the country that Chairs the New Development of BRICS? Name the News Paper which was formed by Madan Mohan Malviya? Against which team does AB de Villers has scored his fastest 150 in ODI?